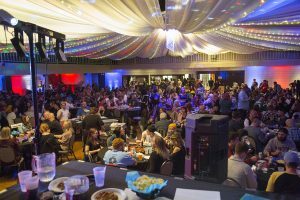 The 2017 10th Annual Celebration of Jukebox Mania held in Regina raised the most money in event history- bringing the ten-year total for the event to over $167,000. This unique event took place at The Turvey Centre on Friday, September 15, 2017, and brought together local Law Enforcement, local Celebrities, and the public. Funds raised at the event benefit Family Service Regina and our Domestic Violence Support and Education programs. The five-hour evening saw music trivia enthusiasts dress up as their favorite bands and battle for the “Best & Brightest” Jukebox Mania award. It was an exciting and fun evening that raised much-needed funds and awareness for Family Service Regina and the work we do for our community’s most vulnerable and at risk. We are elated to not only host another successful event that will empower us to continue to provide programs and services to victims of violence but to also be able to fulfill our mission in creating a healthier Saskatchewan. We would like to take this opportunity to thank iQMetrix and Jump.ca. Both companies have played an active role in the success of this event and continue to lend their skills and support to various areas within our organization. Both of them have been the driving force behind Jukebox Mania and have given their time and talent since 2015.